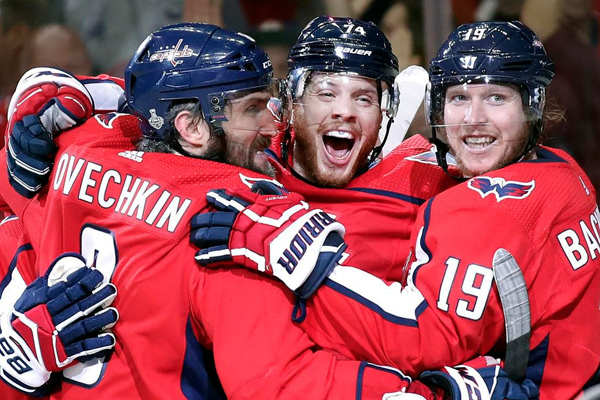 The Washington Capitals are on the verge of winning their first ever Stanley Cup. They are now just one win away from their first ever championship in their 43 year history. The Capitals took a series 3-1 lead after winning 6-2 against the Vegas nights in game 4 of the cup finals. T.J. Oshie, Tom Wilson and Devante Smith-Pelly all scored in the first period followed by John Carlson, Michal Kempny and Brett Connolly. Evgeny Kuznetsov had four assists for the Capitals, and Nicklas Backstrom had three while Braden Holtby made 28 saves. The desperate Golden Knights outchanced the Capitals by a wide margin but just couldn’t make it happen. ”We want the Cup! We want the Cup!” chants rang out from the crowd. The Capitals have never been closer to getting it. Teams that have a 3-1 lead in the Cup Final have won the series 32 of 33 times. The only team that didn’t was the Red Wings in 1942, when they blew a 3-0 lead and lost to the Toronto Maple Leafs in seven games. Game 5 is in Vegas on Thursday.